"The Allied Powers having proclaimed that the Emperor was the sole obstacle to the reestablishment of peace in Europe, the Emperor, faithful to his oath, declares that he renounces for himself and children the thrones of France and Italy, and that there is no sacrifice, even that of his life, that he is not ready to make for the interests of France." After the restoration, the Bourbons caused a copper plate to be attached to the lower side of this table, bearing the ridiculous inscription: "On the 5th of April, 1814, Napoleon Buonaparte signed his abdication upon this table in the King's study." 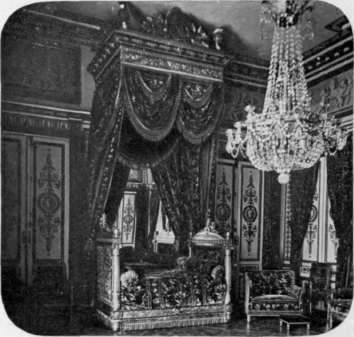 Another apartment closely connected with these scenes is the bedroom of Napoleon. It was here that the defeated monarch passed the awful hours previous to his abdication. For notwithstanding his tremendous efforts in the duel between France and allied Europe which ensued after the Russian campaign, the odds against him had been overwhelming. It is true, in the last months of the unequal struggle, wherever he had been there had been victory, but on the other hand, wherever he was not there was defeat. Napoleon felt his empire slipping from his grasp. To crown all, the Allies had declared they would not treat with him on any terms save abdication. Put to that test, his marshals, ministers, and courtiers, who feared to lose the titles, riches, and estates which he had given them, left him as rats desert a sinking ship. After being in the ascendant for nearly twenty years, Napoleon's star seemed sinking here into an ocean of ingratitude and treachery. Under these circumstances one can not wonder that the horror of his situation drove him to despair. Pierced to the heart by the desertion of men who owed to him everything they had and were, and should have formed a rampart round him with their bodies, Napoleon here attempted suicide. 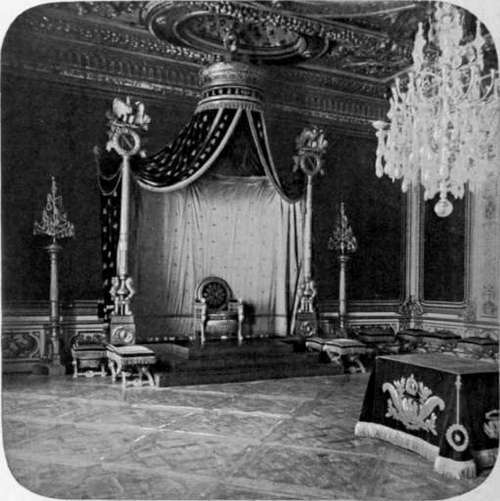 During the night of the 12th of April, the few remaining attendants of the palace were aroused by cries and exclamations. They hastened to the bedroom of the Emperor, but were refused admittance. Only General Bertrand, Caulaincourt, the Duke of Bassano, and the Emperor's physician Ivan were closeted with Napoleon. Suddenly the door opened, and Ivan, deathly pale, rushed down the staircase to the courtyard, mounted a horse and disappeared in the darkness like a madman. This was because Napoleon, writhing in pain upon the bed we may still see at Fontainebleau, had said to him: "Ivan, the poison you gave me has produced no effect." In fact, during the retreat from Moscow, Napoleon had ordered his physician to prepare for him a poison, to prevent his falling alive into the hands of the Cossacks. This the disheartened Emperor, disgusted with ingratitude and treachery, took on that eventful night at Fontainebleau, but it had so far lost its strength, that it was powerless to destroy life. Turning to the faithful friends who hastened to his bedside, Bonaparte murmured sadly: "Alas! everything betrays me now, even poison." It was true. Death shunned him here, as it had done upon the battle-field. Sad as his situation then appeared, it was nevertheless well that he could not foresee the future; for in Napoleon's book of destiny two pages still remained unturned. On one of them was inscribed Waterloo and on the other St. Helena. It was at Fontainebleau that Napoleon for the first time spoke to Josephine of the necessity of a divorce. Standing in the dining-room, one thinks of that ill-fated day, precursor of so much misfortune. It was the 30th of November, 1809. Napoleon and Josephine dined here alone and in almost unbroken silence. In his memoirs, Constant testifies that they ate nothing, and that the only sounds heard during the repast were those of the dishes, brought and removed, and the tinkling of the Emperor's knife which he mechanically struck against his glass. At the conclusion of this mournful ceremony they entered the adjoining salon and were alone. After some minutes shrieks were heard. Constant was called. 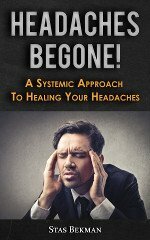 The Empress was on the floor, weeping and exclaiming hysterically, "No, you will not do it! You do not want to kill me!" 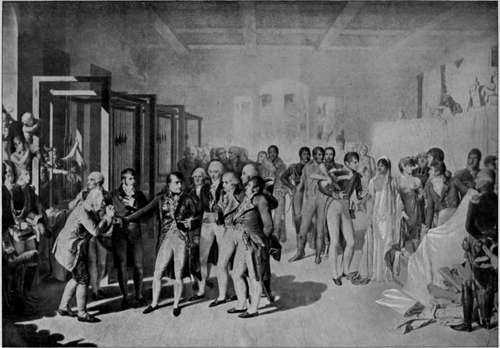 Napoleon And Josephine In The Silk Manufactory At Lyons.